Manila, Philippines - Canon Marketing Philippines unleashed a sharp shooter that is set to push the boundaries of imaging technology with a new DIGIC 8 image processor and 4K movie shooting capability. Welcome the newest EOS M50 designed with the most advanced functionalities that will take anyone’s photography game to new heights. 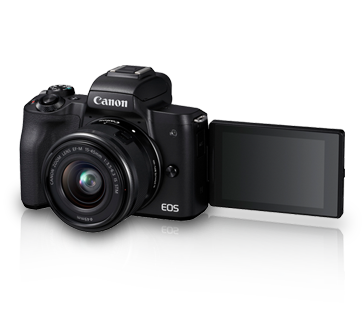 Packing a punch with 4K movie shooting ability and an improved Dual Pixel CMOS AF, the EOS M50 is primed for shooting ultra-high definition movies and boasts of excellent precision focusing even under low light conditions. With the Touch & Drag AF, users are also able to select and move the AF frame via the touch panel while looking through the built-in 2.36 million dot Electrical Viewfinder (EVF), so even the most ephemeral moments can be captured and transformed into lasting memories. Enhanced with the 4K movie shooting function, the EOS M50 is able to produce footage four times the resolution of full HD with exceptional depth and clarity. The 4K Frame Grab function allows for high resolution images to be extracted from footage taken, ensuring not just remarkable still photo performance but also the preservation of memories and milestones. Additionally, with Combination IS, users can expect reduced camera shake during movie shooting. Even when using non-IS lenses, the EOS M50’s built in five-axis stabilization feature ensures that users are able to enjoy seamless and resolute video capture. Users can also shoot in high frame rate of HD 120p to render rich slow-motion movement and expression when played back. The EOS M50’s improved Dual Pixel CMOS AF covers a larger AF area with up to 143 AF points (covering 88% horizontal by 100% vertical area) when a compatible lens is attached, offering high speed AF and impeccable precision over a wider area. The larger AF area also means achieving fast, accurate and smooth AF is possible even when capturing moving subjects. With a continuous shooting speed of approximately 10 frames per second (fps) in one shot AF and 7.4 fps in Servo AF, constantly moving subjects such as children at play or pets in action can be captured with precision.